Earthworms: Armadillos eat earthworms, it's true. So I've heard the recommendation of using earthworms for bait. However, this is tricky, because earthworms tend to be smaller than the bars of a cage trap, and they tend to squirm away or underground. So the solution I've heard is to place the worms in a nylon stocking and suspend it from the back of the cage. I've never tried this technique. I'll explain why in the end, but if you want to go to the trouble of obtaining earthworms and sticking them in a stocking and hanging it from the back of the trap, go ahead. It'll do more harm than good, but if you give it a try, let me know how it goes. Cabbage: A local "expert" swears up and down by cabbage, and implored me to use it in my armadillo trapping. I tested it three times. In each case, I placed two traps side by side, with neither having any advantage that I could tell in terms of location or any other factor. By chance, probably, all three times I caught an armadillo in the cage without the cabbage. Unless cabbage is a deterrent. Which it isn't. But it surely isn't an attractant. The local "expert" went out of business a few years later, by the way. Rotting Bananas: I think the theory here is that the banana will attract bugs which will attract armadillos. In this case, one could use about any kind of food. Hey, rotting meat would attract maggots. I could list other suggested items, but the truth is this: bait of any kind is not only unnecessary, it's most likely going to impede your armadillo trapping by attracting non-target animals like opossums, raccoons, or cats. Armadillos dig their food out of the ground - they rarely eat food already on the surface. They mostly eat live insects and other invertebrates. However, dillos are very easy to trap without bait. Sure, there's a lot of subtleties that go into it, but trap placement is really the only relevant factor - place the trap where an armadillo is going to walk, and you've got him. What Kind Of Bait To Use For Armadillos - Choosing the right location for an armadillo trap is very important when catching the pest animal, but many people will want to increase their chances of success by placing bait that will attract the armadillo into the trap. Armadillos generally only eat live prey that they dig up. Some people swear that there are also certain smelly foods that can also prove attractive to them, and help people to catch and remove their armadillo. 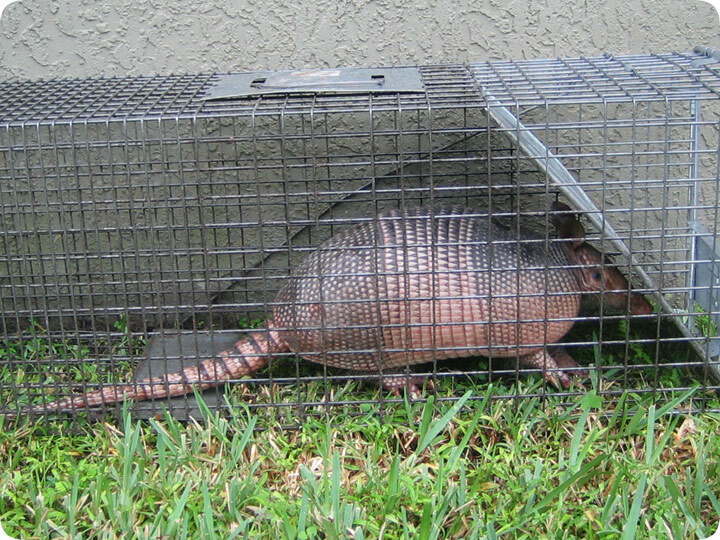 One of the experimental bait options for catching armadillos is meal worms, which should be placed in the rear of the trap to ensure that the armadillo will trigger the door to close behind them. However, sourcing insects and invertebrates to use as bait for an armadillo isn?t always possible, so there are other foods that trappers have experimented with when trying to catch armadillos. Some inexperienced trappers will use meat or smelly fish such as sardines that have started to spoil that they hope will often prove very attractive to the armadillo, because of a strong sense of smell. They also think it is also possible to use fruit that is over-ripe. But armadillos don't work this way. They only sniff at the dirt, to smell out live worms and grubs. They shy away from strong-smelling food on the surface. It's also worth noting that using these foods can often attract other animals to the trap instead of an armadillo.